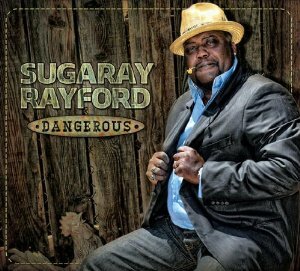 Texas native Sugaray Rayford is a member of the Los Angeles-based supergroup The Mannish Boys and a featured vocalist on the band’s award-winning 2-CD set Double Dynamite – winner of the 2013 Blues Music Award for Traditional Blues Album of the Year. Dangerous showcases Rayford’s powerhouse vocals on a selection of mostly original material which covers a broad spectrum of styles including Chicago, Texas, Louisiana, West Coast and Delta blues, Soul and R&B. Special guests include Kim Wilson, Sugar Ray Norcia, Big Pete, Kid Andersen, Monster Mike Welch, Gino Matteo, Franck Goldwasser, Fred Kaplan, Anthony Geraci, Bill Stuve, Willie J. Campbell and Jimi Bott. Very powerful vocals on this one folks .. and the musicianship and recording quality are top notch. Vocally, Sugaray has that Muddy power .. evident most in the title cut “I’m Dangerous” which also has the powerful harmonica work of Sugar Ray Norcia . Kim Wilson (Fabulous Thunderbirds) provides harp on two cuts .. which combined with Sugaray’s powerful vocals gives that Muddy/Little Walter feel. Songwise, I like cut 2 .. “Stuck For A Buck” .. a Sugaray original. Good stuff .. by a 6’5″ blues singer .. whoa! You can buy this CD online folks .. SUGARAY website has the links. His switch to contemporary music began about 12 years ago in the San Diego area, where he sang lead vocals with a R&B/Funk band called Urban Gypsys. With this band he had the privilege of sharing the stage with many notable artists such as The Average White Band, Dennis Quaid, Joe Luis Walker, Kal David, Super Diamond & Venice, to name a few. After dabbling in blues, Suga realized that the blues was where his heart and soul belonged.